NEW formula! NOW with AST (Advanced Soil Technology). Raises soil pH. Helps correct acidic soils. Helps green up lawns. Works instantly! Long Lasting! High Coverage! One 25lb bag covers 5,000 sqft. One bag equals 5 bags pelletized lime. Not for sale in AL, FL, GA, IL, IN, KY, LA, MS, NC, OH, SC, TN, VA and WV. Patented Advanced Soil Technology allows Lime Plus AST to start working immediately. Works up to 10 times faster than typical lime. Causes pH to change putting dormant fertilizer and nutrients to work. Handy size for indoor and outdoor garden use. 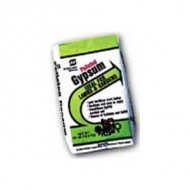 Patented Advanced Soil Technology allows Gypsum Plus to start working immediately. Works up to 8 times faster than typical gypsum. Helps to aerate soil, repairs salt damage, animal urine spots, and increase fertilizer effectiveness. Spreader friendly. Aerates, ventilates, frees up hand clay. Makes it porous. This allows air, water and fertilizer in to encourage plant growth.